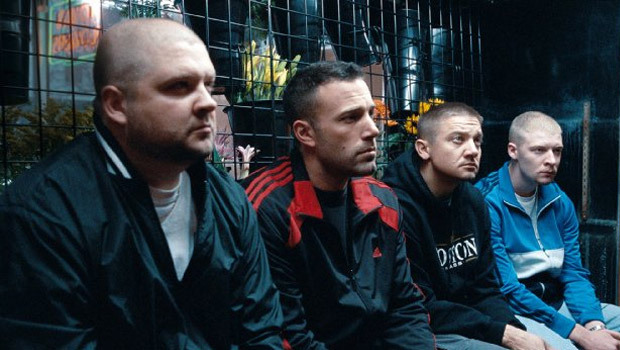 Ben Affleck has revealed that to achieve ultimate realism in The Town, he employed real townies and a number of ex-cons in his cast – some even playing cops and FBI agents. One of these was Owen Burke, who was in prison for drug trafficking and various other ‘ugly charges’ just months before he got the call from Affleck to star in his follow-up to the award-nominated Gone Baby Gone. When Ben Affleck called, Owen’s first response was “Who the f*** is this?” but what he was convinced was a wind-up turned out to be the start of his path to the big screen. At just 19, having jumped the queue at an open audition he thought he had no chance of getting in his home town Charlestown, Owen secured the role of Desmond Elden, the baby of Affleck’s four-man gang of armed robbers in the Golden Globe nominated film. I caught up with Owen to find out more about his experiences filming The Town. Can you just introduce yourself? What’s your background prior to The Town? Owen Burke: Prior to The Town, I was in a rebuilding stage in my life. I was twenty years old, recently released from a short stint in county jail working landscaping ‘off-the-books’ attending community college trying to get my life back on track. Before that I was a kid from Charlestown who was caught up in the criminal lifestyle. Before that I was a high school student athlete, captain of my high school varsity baseball team. You said you got the part off a single line at an open audition – can you remember what that line was? Owen Burke: I cannot remember the exact wording, but it was something along the lines of “we wait until one of the guards unlocks the back to remove the coal bags, that’s when we hit him”. How long did it take to find out you’d got the part? Who let you know and how did it feel? Owen Burke: Five months. Carolyn Pickman informed me over the phone after a week-long auditioning process that I was being offered the part of “Dez”. The feeling that came over me is indescribable. In the few years prior to The Town I hadn’t done much to make my family proud. My father, being a huge fan of movies, and being the person who literally forced me to audition in the first place, was so overwhelmed when I told him that I was being offered a role in the film. Witnessing the happiness that he felt filled me with something I hadn’t felt in a long time. What was the filming experience like? Owen Burke: The filming experience was eye opening. Day after day, the cast and crew came together with the focus and intention of creating the best film possible. I’ve been a movie fan throughout my life, so being able to see that process firsthand while being a part of it at the same time is one of my most memorable experiences to date. How would you describe The Town and your character? Owen Burke: I see The Town as a film that portrays the affect one generation’s influence has on the next. The character Dez was someone that had the opportunity to carry on with an honest blue collar lifestyle but through his own motivations and influence of older peers, was overcome by the criminal life he pursued. What’s your favourite scene in The Town? Owen Burke: My favourite scene in The Town is the Fenway Park shoot out scene. That sequence took longer to film than any other, so to see it come together the way it did makes it stand out to me. What was the toughest to film? Owen Burke: The toughest scene to film, for me, was the first robbery scene at the Cambridge Merchant’s Bank. My character had a lot of fast paced action that had to coincide with other characters fast paced movements. Due to the scene overlaps it was crucial that they were repeated with continuity in each take. Did you get on well with Ben Affleck? How did he direct you? Owen Burke: Yes, it was very easy to get along with Ben. I honestly don’t believe there is one person that was involved in the production that would say any different. One of the reasons I feel we had a good working relationship is because he directed me the same way he directed the more experienced actors. Through his style of direction, I gained confidence because I knew he was holding me to the same expectation regardless of my acting inexperience. How do you rate your performance in The Town? Were you pleased when you saw the results on the big screen? Owen Burke: I don’t feel that I can honestly rate my own performance. When I finally saw the film I was very happy with the end result. After watching the The Town and seeing the overwhelming positive feedback others had for the film is the most pleasing feeling for me. The premiere was at Fenway Park, home of Boston Red Sox. Was that a special night? Meet any on-screen or off-screen heroes? Owen Burke: The premiere at Fenway Park was a very special night. Being able to watch a film I was part of in the same ball park that I once dreamed of playing in as a child is an event I will not ever forget. Any amusing stories from on-set? Owen Burke: There wasn’t anything too crazy, at least during my time on set anyways. Owen Burke: I currently attend community college where I plan to earn my associates degree in General Education before transferring to film school. I work part time as a bartender at a popular establishment in Charlestown. When I’m not working or in school I’m working on acting. I’ve had some continued success since The Town, I’ve booked a few roles on local projects that I’m very excited about working on. Read the Future Movies review of The Town.